The intention of this short piece is to describe the main philosophical influences on Pattabhi Jois and Ashtanga Yoga. The profound insights of Indian philosophy have the potential to transform people’s lives. I will sketch the philosophical and theological influences on Pattabhi Jois – the Upaniṣads, the Yogasūtra, Vedānta, Tantra, and haṭha – and you the reader/practitioner may determine whether these perspectives help us to see clearly and become more free. In discussing the philosophy of Ashtanga yoga I am taking a wide definition of philosophy – not just theories of being and of knowing, but also of god, of freedom from the world, and our relationships with ourselves, our bodies, and other people. This article is written in the light of recent acknowledgements within the Ashtanga community that Pattabhi Jois engaged in inappropriate sexual adjustments on women. I believe, and am grateful to, those who have spoken up. This new era of honesty complicates the picture of the philosophical influences on Ashtanga yoga. Does the failure of Pattabhi Jois to follow the ethical ideals that he taught undermine those ideals? Does Pattabhi Jois’s failure compromise the foundations of Ashtanga yoga itself, built as it is on those ideals? 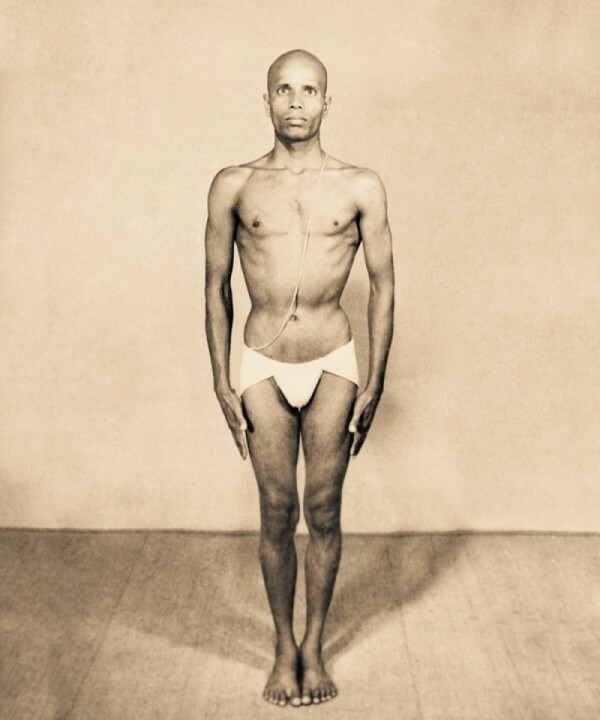 More controversially, did Pattabhi Jois believe that his adjustments were somehow justified by an esoteric understanding of anatomy? Ashtanga or aṣṭāṇga was the name chosen by Pattabhi Jois to describe the style of yoga which he popularised. The name aṣṭāṇga comes from the eight (aṣṭa) limbed (aṅga) system set out in the Yogasūtra of Patañjali, compiled in c. 325-425 CE (Maas, 2013). Flowing sequences of postures characterise Pattabhi Jois’s system, yet postures play a minor role in the Yogasūtra, which focuses primarily on meditative practice. The decision to call what he was teaching aṣṭāṇga reveals the philosophical associations he wished to make. It emphasises the importance of ethical considerations and links the physical features of his system with the cerebral meditations of the Yogasūtra. These ethical considerations are the first two limbs of the Yogasūtra’s aṣṭāṇgayoga, the yamas and niyamas. The five yamas are ahiṃsa (non-harm), satya (truthfulness), asteya (non-stealing), brahmacārya (celibacy) and aparigraha (non-covetousness). The niyamas are tapas (heat), svādhyāya (self-study), īśvarapraṇidhāna (devotion to god), saṃtoṣa (contentment), and śauca (cleanliness). The third, fourth and fifth limbs are respectively postures (āsana), breath control (prāṇāyāma), and sense withdrawal (pratyāhāra). The final three limbs are considered internal limbs and are concentration (dhāraṇa), meditation (dhyāna) and absorption (samādhi). It is these final three which constitute the main subject matter of the Yogasūtra. Some students reported that Pattabhis Jois said he taught āsana, prāṇāyāma, and some pratyāhāra, that the yamas and niyamas are extremely difficult, and that students had to go and see someone else for the final three limbs (Byrne, 2013, p. 113). However many found that Pattabhis Jois and his successor, Sharat Jois, discourage students from seeking out other teachers. Though he is world-famous as a teacher of postures, the mastery of which is exquisite to behold, Pattabhi Jois’s religious and philosophical background is of Smārta Brahmanism rooted in the ideals of Śaṇkarācārya’s Advaita Vedānta. This non-dual philosophy asserts that there is a unity pervading the apparent diversity we perceive in the world. Pattabhi Jois described this unity as God: ‘Yoga is one. God is one’ (Medin and Summerbell, 2014, p. 19). The rich textual resources from which this philosophy is derived, and which Pattabhi Jois frequently quoted, include the Upaniṣads and the Bhagavad Gītā. Before devoting himself to teaching yoga Pattabhi Jois studied Sanskrit and the Vedas from 1930 to 1956 at the Sanskrit College in Mysore. He earned a professorship in Advaita Vedānta which he held until 1973 (Stern, 2010, p. xvi). According to Pattabhi Jois the means to access the philosophical truths of non-duality and experience God is haṭhayoga. Haṭha is the mechanism, the technique through which these philosophical and theological understandings can be accessed. Pattabhis Jois’s main work, Yoga Mala (Jois, 2010), dives deeply into the esoteric world of haṭhayoga to account for how, through practice, the yogin can experience these truths. Pattabhi Jois described how haṭhayoga ‘means the union of the opposing energies of the body and the channeling of these energies into the central pathway. And this comes about when the surya nadi [right nostril] and chandra nadi [left nostril] are controlled, and the vital energy of these two channels merges in the central pathway of the spine. So, when the prana is finally at rest and no longer moved by the various sense organs, we then realize God inside. That is our Self, our true identity. So, Hatha yoga is experiencing God inside’ (Medin and Summerbell, 2014, p. 12-13). The Tantric influences on Pattabhi Jois are difficult to assess. A commonly repeated phrase within the literature is ‘privately a Śākta, outwardly a Śaiva, among people a Vaiṣṇava’ (Flood, 1996, p. 201, n. 41). Tantric traditions, of which Śākta or goddess lineages are a part, build on the philosophical heritage of Patañjala-yoga and Vedānta. In turn, Tantra is the breeding ground for haṭhayoga (it is thought that the earliest haṭha texts such as the 10th Century CE Amṛtasiddhi were composed in a Buddhist Vajrayāna milieu (Mallinson, 2016)). Sexual ritual and the occasionally anti-social and deviant nature of these practices earned Tantra a bad reputation both amongst conservative Hindus and India’s colonial administrators. This may account for Pattabhi Jois at least publicly associating his system with that of Patañjali’s orthodox, cerebral, and meditative system. Ritual purity is thus a motivation for aligning with certain philosophic positions. There is also a sense in which a philosophic perspective is achieved through the practice of haṭha but is not defined by haṭha – rather haṭhayoga is the force, the motor for achieving a goal or an understanding: ‘Yoga is a soteriology that works regardless of the yogin’s philosophy’ (Mallinson, 2014, p. 1). Both Patañjali’s Yogasūtra and the principle text of haṭhayoga, the Haṭhapradīpikā, are careful to express themselves in non-sectarian terms (for example in the Yogasūtra’s description of an apparently optional, non-specified form of god 1.23-29, and its contentless description of the ultimate state of yoga, kaivalya, the aloneness of consciousness (Bryant, 2013); the Haṭhapradīpikā too in 4.3-4 describes the ultimate states of many different schools of thought as being equivalent). The philosophical influences on Ashtanga yoga and its founder, Pattabhi Jois, range from the ethical and meditative concerns of Patañjali’s Yogasūtra to the non-dualism of Vedānta, drawn as it is from the rich teachings of the Upaniṣads and the Bhagavad Gītā. The force for achieving these understandings is the esoteric system of haṭhayoga with its āsana, prāṇāyāma, pratyāhāra and locks and seals (bandha and mudrā). There is only one way to understand the reality of these teachings according to the Ashtanga system: practice. Pattabhi Jois said: ‘To practice asanas and pranayama is to learn to control the body and the senses, so that the inner light can be experienced. That light is the same for the whole world. And it is possible for people to experience this light, their own Self, through correct yoga practice. It is something that happens through practice, though learning to control the mind is very difficult. Most important though is the practice. We must practice, practice, practice for any real understanding of yoga. Of course, philosophy is important, but if it is not connected and grounded in truth and practical knowledge, then what is it really for? Just endless talking, exhausting our minds! So, practice is the foundation of the actual understanding of philosophy’ (Medin and Summerbell, 2014, p. 23). Pattabhi Jois frequently emphasised the Yogasūtra’s recommendation of faith (śraddha, Yogasūtra 1.20). The Yogasūtra 2.26 also emphasizes, ‘The means to liberation is uninterrupted discriminative discernment’ (translated Bryant, 2013). My sense is that Pattabhi Jois’s failure to live according to the ideals that he espoused does not undermine those principles: they have been at the heart of the human pursuit of meaning and purpose in life since distant time. As the Ashtanga and wider yoga community grapples with acknowledging a painful past and building a positive future, I hope that non-harm (ahiṃsa), truthfulness (satya) and discriminative discernment (viveka khyāti) will be an inspiration and a rallying cry. Ruth would like to express her sincere thanks to Hamish Hendry, Mark Singleton and Eunice Laurel for their insightful comments on a draft of this paper. Akers, B.D., 2002. Hatha Yoga Pradipika, The. YogaVidya.com, Woodstock, NY. Bryant, E.F., 2013. The Yoga Sutras of Patanjali. North Point Press, New York. Byrne, J., 2013. “Authorized by Shri K. Pattabhi Jois”: The Role of Paramparā and Lineage in Ashtanga Vinyasa Yoga, in: Singleton, M., Goldberg, E. (Eds. ), Gurus of Modern Yoga. Oxford University Press, pp. 107–121. Flood, G.D., 1996. An Introduction to Hinduism. Cambridge University Press, New York, NY. Jois, S.K.P., 2010. Yoga Mala: The Seminal Treatise and Guide from the Living Master of Ashtanga Yoga. Farrar, Straus and Giroux. Maas, P.A., 2013. A Concise Historiography of Classical Yoga Philosophy. Pre-Print Version Artic. Publ. Eli Fr. Ed Period. Hist. Indian Philos. Vienna Samml. Nobili Inst. Für Südasien- Tibet. Buddhismuskunde Univ. Wien 2013 Publ. Nobili Res. Libr. 37 P 53-90. Mallinson, J., 2016. The Amṛtasiddhi: Haṭhayoga’s Tantric Buddhist Source Text. Mallinson, J., 2014. Haṭhayoga’s philosophy: a fortuitous union of non-dualities. J. Indian Philos. 42, 225–247. Medin, A., Summerbell, D., 2014. 3 Gurus, 48 Questions. Nāmarūpa Categ. Indian Thought 12–25. Stern, E., 2010. Foreword, in: Yoga Mala: The Original Teachings of Ashtanga Yoga Master Sri K. Pattabhi Jois. Farrar, Straus and Giroux.